Inducted 2005. All-State Basketball Player Finished Among Top Five All-Time Scorers in School History. The exploits of the Quincy Notre Dame basketball teams in the early 1980s were overshadowed by the success of the Quincy High School teams of the same era that won three state tournament trophies. However, the Raiders “quietly” compiled a 71-14 record from 1980-83, and McCaughey put up some remarkable numbers during that time. McCaughey, a 1983 graduate of QND, averaged 13.8 points per game as a sophomore when the Raiders posted a 23-4 record. 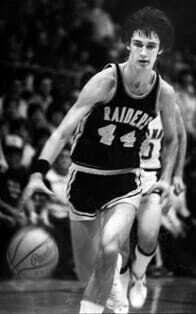 His scoring average rose to 16.4 points per game as a junior when the Raiders went 25-5, and his 30-point peformance against Liberty in the 1982 regional title game will be remembered as one of the finest individual showings in school history. He scored 17.6 points per game as a senior, was named co-Player of the Year by The Quincy Herald-Whig and was an All-Stater when the Raiders went 23-5. McCaughey was a player ahead of his time. At 6-foot-7, he handled the ball and shot from the outside, as well as hold his own in the lane, where most high school players his size were expected to be stationed. His 1,329 points rank No. 4 among the all-time scoring list. He signed with Eastern Illinois University out of high school, but he eventually played for three years at Southeastern Louisiana University in Hammond, La., where he started for two years and had a career scoring average of a little more than 7 points per game. McCaughey now lives in Baton Rouge, La., with his wife and four sons. He is a major account executive with Pitney Bowes. I want to thank the committee for this wonderful honor. I would like to thank my coaches, Leigh Conover and Bob Kies. I want to thank all my teammates, in particular John Lubbe, Mike Ortbal and Roger Sparrow for accepting me on the varsity team as a sophomore. I also appreciated all the fans who supported Raiders basketball in the early 1980s. It was fun playing in front of a packed house at The Pit. I want to thank the administration, staff and teachers at QND. As an adult, I now appreciate your sacrifices and your dedication to the Quincy community. Finally, I want to thank Ray Heilmann for all he does for QND and Scott Douglas for elevating Raiders basketball to new heights.